The band played through some originals and standards – numbers that appear on their recordings, like “Cold Hearted,” “Have You Ever Loved A Woman,” and “Black Boots.” Later on, Moss said that the home of the blues may be Chicago, but the heart of the blues was in New England, and charged us with helping keep the blues alive by writing to the new mayor of Boston. Smoken Joe’s Barbeque in Brighton is in danger of closing, and needs help. He wanted us to know that venues like this were few and far between and this is one of the only one’s in Boston. 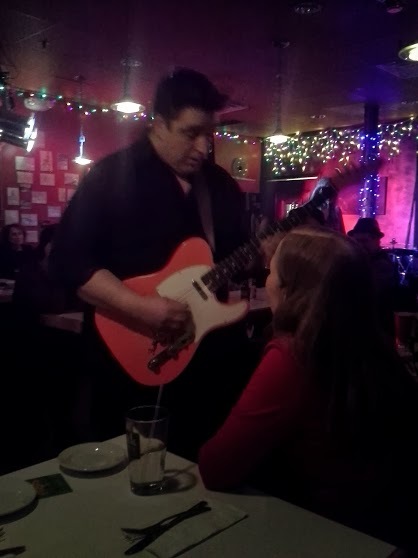 Moss walked out into the audience and played his guitar suggestively for beautiful women in the club. Singing, “the first time I met you baby, I knew you were the one for me.” Moss did his trick of playing the guitar behind his neck a la Jimi Hendricks and again reminded the audience to write to the mayor on Joe and Wendy’s behalf to keep Smoken Joe’s open. Friends of the band passed a tip jar making it feel like a down home revival with Thompson’s gospel drumming. They ended the set with a terrific version of Freddie King’s “Hideaway.” Buddy Guy has called Moss “Energetic, a strong guitarist, and always a crowd pleaser.” And he’s not wrong. Catch them touring while you can.